The prototypes of the swarm system (left) and a video that shows my final project that implements serveral applications on a group of robotic agents developed by Tamer Abukhalil and Madhav at the University of Bridgeport under the supervision of Prof. Tarek Sobh. 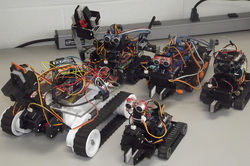 The physical swarm system itself is composed of five simple and slightly intelligent robots. Hence, robots will have very simple behaviors but the overall high intelligence of the group is actually created by the simple acts and moderate local intelligence of each individual robot. Each robot behavior is determined by running different programs to cope with the changes of the overall swarm configuration. Each program contains parameters that will be assigned to the values initially set when starting UBSwarm interface showed below.